Right, the Crows got a win. Now let’s never speak of it again. Four goals from Eddie Betts was the clear highlight for an underwhelmed Adelaide Oval crowd on Saturday. Photo: Michael Errey, InDaily. Bizarrely, this was one of those games where people were leaving the ground pissed off, as though they actually preferred being shafted by Hawthorn the previous week because we played better and it wasn’t the ugliest game in living memory. I’m not sure we’re quite at the stage yet of being entitled to be annoyed when our team wins. Just because we all got carried away with thoughts of a homeground trouncing with the Crows putting on a goal-kicking clinic at the decimated Dockers’ expense doesn’t mean we can justifiably be miffed when we, after all, come away with the four points. But let’s just say it wasn’t a win we’ll be re-watching for years to come. This game was like an exorcism – it was taxing, exhausting and ugly but, ultimately, necessary. And it also involved a bit of Linda Blair-style profanity – mostly by me. I had half-expected a low-scoring grind on account of the predicted rain. In the event, however, the weather was so warm and pleasant that if Brenton Sanderson was still coaching us he’d have demanded the AFL ban late-April matches at Adelaide Oval. Sadly though, the Crows had difficulty adjusting to the perfect conditions, so we got the scrappy, sloppy slog in any case. Fremantle spearhead Matthew Pavlich watches another one sail askew. Photo: Michael Errey, InDaily. Freo’s halftime return – 2.11 – looked so odd that a conspiracy theorist could be forgiven for assuming it was a deliberate and touching tribute to their absent ruckman Aaron Sandilands. What was odd, however, was that several of his teammates appeared to be suffering the same condition. Indeed, my biggest fear for this game wasn’t losing, but picking up a season-defining injury, of the sort the Crows have blissfully avoided thus far. Having given voice to this fear, I was then certain I had jinxed things when carnage was unleashed in the second term. Fortunately what looked like two ACLs and a shoulder reconstruction to, respectively, Seedsman, McGovern and Lever turned out to be two knee knocks and a sore arm, leaving Rory Laird’s toe our biggest injury worry from the game. 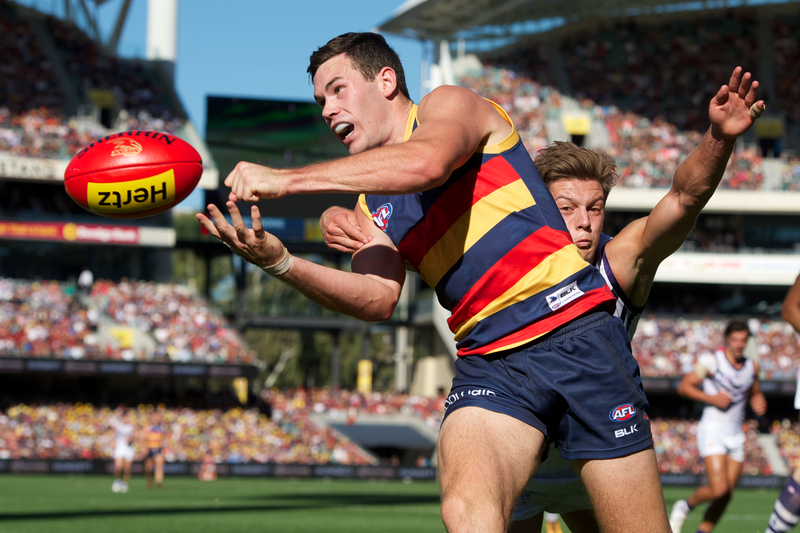 Mitch McGovern: Not injured.Good. Photo: Michael Errey, InDaily. The mate of a mate who always seems to bring along one of the opposing team’s supporters just to mess with us threw a curveball, and brought along a Hawthorn supporter instead. What someone who is normally accustomed to seeing skilful and attractive football would have made of the comical scrap is anyone’s guess, but it did mean the rest of us spent the entire duration trying to nonchalantly convince him that we normally played a whole lot better and that the display wasn’t indicative of our general standard. Fortunately, his team got absolutely spanked later the same afternoon by GWS, which made me feel much better about the whole thing, and which also emphasised the silliness of those ubiquitous pre-season prognostications that made much of the toughness of the first eight weeks of Adelaide’s draw. We play the Giants in Round 10. Anyway, I may have missed out on going to Paris last week, but I consoled myself at the time that at least I’d get to watch the Crows play high-quality football against Freo and Port lose to Richmond. Not really my week then! However, Saturday night’s result would inevitably have some kind of consolation, given one or other of the Power and the Tigers was always going to lose. Charlie Dixon took advantage of Alex Rance’s absence to make wine from the Tigers’ tears. Photo: Tracey Nearmy, AAP. There really is no explaining Richmond’s perpetual malaise. For years and years they would sack coaches who might well have been pretty good, because they didn’t get more success from a middling list. Then they saw the error of their ways and appointed a young coach who they empowered to slowly build the list with the patient backing of the board. Turns out that didn’t work either. Really, their constant ability to torment their supporters is as unexplainable as the fact they still have so many supporters to torment. It’s something that is beyond the realms of rational thought, like in that scene at the end of Chinatown. All you can do is shrug your shoulders at the unfolding carnage and reason, “Forget it, it’s Richmond.” And then walk away as quickly as possible. For Port, though, this was one of the more important wins they’ve had under Ken Hinkley, and I’m cool with that. Really. After all, I can take comfort from the fact they will lose again. And often. 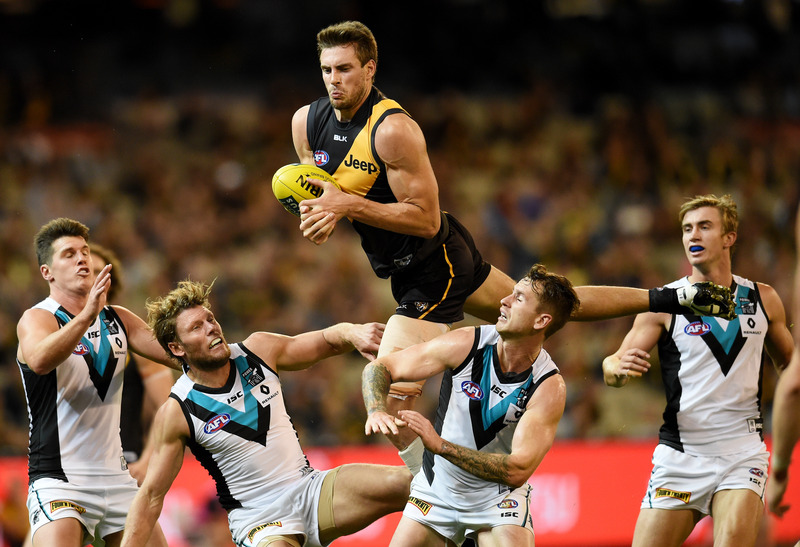 Richmond started full of intent, dominating the early play during a fifteen minute frenzy during which the phrase “Tigers looking good” had never sounded so sweet. But, bizarrely, from about halfway through the first quarter Port played clearly the better football, settling admirably after a couple of clangers from Justin Westhoff, who clearly had some ill-advised bet on with Tom Lynch as to who could pull off the more embarrassing faux pas in front of goal. Given the Power’s hideous and much-publicised injury list, the only conclusion we can draw from all this is that it was Robbie Gray and Chad Wingard that were holding them back all along. Either that, or that Richmond are just crap. Still, Hinkley may have taken the evolution of the game into strange new territory with his “ruck-free-football” on Saturday, wherein Hampson and Maric collected 61 hitouts between them to Dougal Howard’s eight, and it mattered hardly a jot. It’s as if he was making the point that unless you have an Aaron Sandilands as your starting ruck – and let’s face it, who does? Not even Fremantle, most of the time – you might as well take your chances roving the ball. Shaun Hampson sailing over the Port players’ heads, without accomplishing much. Photo: Tracey Nearmy, AAP. 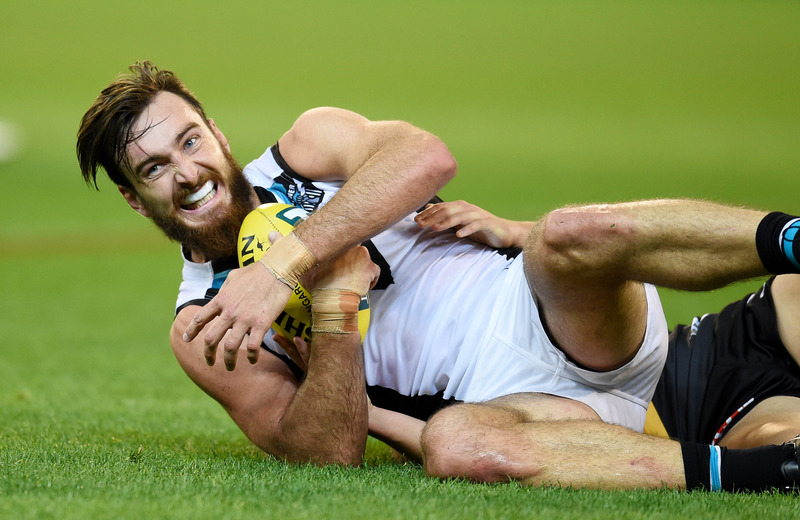 But it was, nonetheless, a line-in-the-sand moment for Port on the weekend. The build-up had that feel to it, epitomized by that brilliant PR offensive of Boak and Hartlett coming out early in the week to scotch some rumours that hardly anyone had ever heard before. For what it’s worth, I don’t put Port’s recent malaise down to internal rifts, an overrated list or Michael Voss. I’m calling it: it’s the game day experience. That INXS anthem conceit has gone stale. It was inevitable. Sure, Never Tear Us Apart was all well and good when it was about bringing the old and new club back together, but now the team is struggling amid reported internal conflict it just sounds like bad sarcasm. The fans have stopped believing it. Lyrics about making wine from tears are now more a regular reminder of Charlie Dixon’s fondness for grape juice and the bit about having wings but not knowing why just make everyone recall the importance of Matt White to the team’s structure. So there’s only one solution: Port need a new theme song. They do, however, seem to have some kind of rapport with the INXS copyright-holders, so that presents the perfect opportunity to mine the Farriss brothers’ back catalogue for an alternative anthem. Indeed, it’s such an extensive back-catalogue, they could use a different track every other week, sort of an evolving soundtrack to 2016. Mediate – dedicated to Boak and Hartlett. New Sensation – dedicated to Charlie Dixon. Ironically, of course. Don’t Change – about Hinkley’s game plan. Mystify – the general attitude of supporters who were certain of a top-four finish. Need You Tonight – dedicated to Paddy Ryder and/or Jay Schulz. What You Need – another tall forward/ruckman, presumably. And also another decent outside mid. And a key defender. Just Keep Walking – a wry self-reference to their lack of outside pace since White’s injury. Listen Like Thieves – because everybody’s down on their knees. Kiss The Dirt (Falling Down The Mountain) – probably self-explanatory. Disappear – in the latter rounds, on the team’s finals hopes. Then, after any given home loss, the fans could stick around for a medley of Bitter Tears and Baby Don’t Cry. I’ve never been one to give advice to Port Adelaide (no, really!) but I’m quite certain this strategy would reinvigorate their jaded players and supporters like a nice glass of red reinvigorates Dixon before a big game. Touch of the Fumbles is InDaily’s weekly AFL column, published each Monday during the AFL season. Yes, it’s shamelessly biased. Even up the score in the comments section below.